I get many many requests for information on my Ceramic Hand & Footprint Training program. Many lookie loos who are interested but not willing to commit to training. Many who want to start a business but are scared to get started. 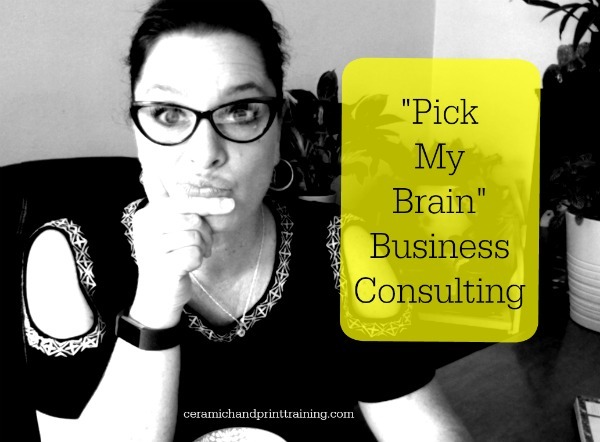 Many people not willing to invest in themselves and pay for a training program and like to "pick my brain". All of that is fine and well, BUT I know my training is valuable. I know my training is comprehensive. And I know my training program will help you get a home business running and running well. But the bottom line is YOU have to decide you are ready. I just want to take few minutes and write this letter to you and tell you how blessed I am that I found YOU and your amazing training program! When I decided to finally give you a call and order the program I did not have any experience with clay and ceramics whatsoever. I was just a mom who was desperately looking for a way to stay at home with her newborn baby and be able to help her family. I was a little reluctant at first and thought this is another scam going around. I WAS SO WRONG!!! A month after I received your dvd and the manual I was creating amazing ceramic impressions all by myself and you were there for me each and every step of the way! Your program was incredibly easy to follow through. Having a baby on hand (my beautiful son) and some clay to play with I was getting better and better and in August, 2013 I launched my business. It has been few months now and I am enjoying my busy schedule! I started to attend baby shows and printing parties too. AND THE BEST PART IS I am able to stay at home, take care of my amazing little cutie and help with my family income. I decide when I am going to work and when I will spend time with my family. I JUST LOVE IT!!! And that is all happening because of you! P.S If someone is wondering if they can run this business from their apartment I can assure you can. I have been doing it and I love it!!! When you are ready to take that first step I will be here to help you get going. Don't let fear stop you from an amazing journey. This business is just that, a journey. It will be full of newness and learning. It will be full of beautiful experiences that will bless your life.